Zlatan Ibrahimović, who iswidely regarded as one of the world’s biggest leading lights in football, has declared today that he is to be part of an exciting and totally new endeavor! Yes, Bethard, the ambitious and perfectly crafted, Swedish-owned betting company, have announced today that they have indeed moved into an official partnership with this larger than life, world renowned sports star! Regarded as Sweden's all-time greatest player, Zlatan Ibrahimović is clearly one of the world's all-time best footballing talents, and, practically oozing self-confidence, he’s not afraid to show that he knows it either. In fact, Zlatan’s - I can, and I will, watch me - style winner’s attitude, along with his understandably boastful nature, and, the swagger which goes hand in hand with those things, only add gravitas to this epic partnership! Both Bethard’s ‘’Dare to Do’’ and ‘’Winners Dare More’’ slogans, share at their core, the same winning mentality that has helped to make Zlatan the star he is today! 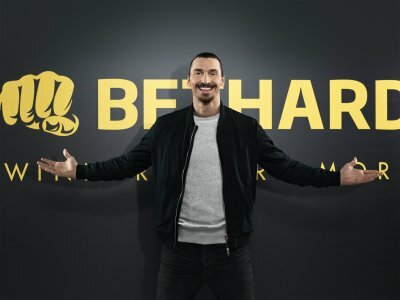 Bethard founder, Erik Skarp, believes that this partnership and alliance with Zlatan, will help to drive the company up to the next level, ensuring that it becomes the force in global sports betting, which it was always meant to be. Bethard holds a lot of store in the phrase ‘Team Spirit’. Indeed, if they were a piece of sea side rock then ‘Team Spirit’ would run right through the center of everything they do! This key value has proven them to be the ‘Great Place to Work’ of 2018 too, as they won that very title at the 2018 International Gaming Awards. With an incredibly dedicated, and highly motivated staff body, working tirelessly behind the scenes, Bethard believe that everything starts with that ‘Team Spirit’. After all - ‘’It’s a team who plays together, that stays together’’ and when that same team is also both shiny-brass-bold, and, highly creative, you know that you’re on to a winning formula. This winning formula is also obviously something which helped to capture and keep hold of the interest of football’s illusive living legend Zlatan Ibrahimović. "Zlatan is our partner and provided that we do great things together it will hopefully last forever. He is not our poster boy, but he will be with us and develop the company, above all, into a brand that people want to associate with." Not that that has ever really been an issue for this stunning and incredibly well-received online casino, who have new players already lining up around the metaphorical block to become members. "Today there are hundreds of ambassadors for different gaming companies, which means it’s hard to differentiate which person is associated with a brand.’’ Says Skarp. Going on to say that: ‘’We wanted to do something different, by not following the crowd’’. ‘’There was only one stand-out individual we considered to be the world's biggest winner’’. ‘’One who dared take the challenge, and that was Zlatan". Skarp also remembers how Zlatan responded after he first joined the folds of the Bethard team, claiming Zlatan said that "I used to win, I won a lot. I'm looking forward to winning with you at Bethard. Bethard is the only betting company that managed to catch my attention. You want to know why? Because I share the idea that winners dare more". So, despite Zlatan’s history of turning down such partnerships, it would appear that this really is a match made in heaven, made between two factions, who seem to both be reading from the same page. For more information about this amazing pertnership Read Here. If you’re interested in finding out more about this truly epic online casino, then as a new player you’re in luck, because Bethard offer newly registered players a very hospitable Welcome Bonus too! Bethard is due to launch, go live and be available to players in the UK in the very near future! So, for UK players, this juicy little Bonus will soon be in reach! Once you’ve signed up, you’ve the potential to majorly dose up your dosh when you make your 1st deposit at Bethard. How does a 200% Cash Match Bonus up to $200 sound? Well then, now top it up with a terrific 25 Wager Free Spins to use on the web’s most popular slot game: Starburst! And all when you make a 1st deposit of just $25 or more too! Then… Go have a ball playing with all of your Bonus and Wager Free Spins! Go Play at Bethard Casino Today! All deposit Bonus amounts and/or Spins must follow the bonus wagering requirements as stated before withdrawal. The maximum amount of bonus is £200. All deposit bonuses may be on an opt-in basis, not all games contribute, and minimum deposit requirements must have been met. For full participation details refer to Bethard’s Bonus T&Cs. Don’t miss out on a minute’s more of the action! Follow in the footsteps of a LEGEND and sign up for an account with Bethard Casino today! 27 Mar 2018-Offer valid as of date published. T&Cs apply.